This 12 inch RG58 cable is terminated with a PL259 on one end and a Female Motorola adapter on the opposite end. Manufactured by Procomm, an industry leader in Citizen Band radio accessories. 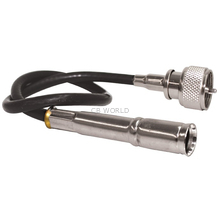 This short adapter makes it easy to utilize an existing CB radio antenna with your radio. Note: This is not for adapting a CB radio for use with standard AM/FM car radio antennas.